Everyone likes to get things for free. We like coupons for discounts on food and restaurants, we like free advice, we like free medical care, and we also like finding a free Vegas casino. One of the hardest things to find for free is information on the best way to eat for optimum health. For example, diabetics can get dramatically opposite advice on how to get healthier and keep their blood sugar levels down. Even an ostensibly reliable source as Ted Talks can feature one lecturer who contends that only a very low-fat diet with plenty of carbohydrates can keep blood sugar low whilst another lecturer says that only a diet high in fat and very, very low in carbs can enable diabetics to fight off the harm their condition can cause. Almost every site that talks about healthy eating gets around to extolling the virtues of the Mediterranean diet. Here the term “diet” refers to a general eating programme not a weight loss programme. This diet consists of a lot of fruit and vegetables, a little meat and chicken or turkey, and a sizable amount of fish. It also includes Greek yogurt, olives and olive oil, legumes especially lentils, rice, and lots of coffee. The coffee is the one element of this diet that is not particularly healthy! The first reason is that the Mediterranean people for centuries ate relatively little food. Certainly they ate enough to live but the Western custom of gorging oneself never took hold in the Mediterranean Basin until late in the 20th century. Even now, most people in this region eat relatively little when compared to the great quantities of food consumed in the United States, for example. A breakfast often consists of cut raw vegetables, some yogurt, and coffee. The people of the Mediterranean Basin never (almost never) eat meat for breakfast and usually eat meat only at lunch. This makes supper a small, simple meal that unintentionally follows Benjamin Franklin’s advice to eat supper like a pauper. The Mediterranean nations have long growing seasons. Some countries have two full growing seasons so the fresh vegetables available year-round are truly fresh, picked in the morning and served at a meal that day or the next. Canada and the United States rely on vegetable that have been picked early to survive the long trip to markets all over North America. In this area, people also use copious quantities of parsley, cilantro, lettuce, dill, and many other greens. In the winter, women go out in the forests and fields and pick weeds. These weeds can be cooked almost like spinach. Arab restaurants feature several dishes of these weeds on their winter menus. The centrality of vegetable is apparent in any authentic Mediterranean restaurant where the waiters serve a large sampling of salads even before you’ve ordered your main course. In order to eat a Mediterranean diet in eastern Canada, we have to rely on vegetables that are as fresh as possible. Home canning can make vegetables healthier. The most popular fruit in this region is the lemon. Mediterranean people have been squeezing lemons onto raw vegetables for centuries. Lemon juice is considered one of the healthiest juices since we can’t drink it as a drink; we use it more as a condiment. Lemon juice goes into two of the most popular dishes in the eastern Mediterranean: hummus and tahini. Hummus is cooked and mashed garbanzo beans that are mixed with lemon juice, garlic, olive oil, and parsley. Tahini is sesame paste that is thinned with lemon juice and garlic. Other popular fruits are all manner of citrus and local fruits. The Mediterranean climate is generally mild but the Eastern Mediterranean is milder than the western. The most popular meats are the same as elsewhere in the world but they are eaten more as condiments to other foods than as the main course. For instance, grape leaves are a staple of this diet. Grape leaves may be stuffed with meat or rice or both but the amount of meat is relatively small. Grape leaves are cooked slowly for a long time with lemon juice and olive oil. This oil has gained widespread popularity in Western societies in the last 50 years or so. Before that only people with Mediterranean heritage used olive oil in their homes. In North America, corn oil was king for generations. Olive oil is a great source of linoleic acid which is considered a major part of a healthy living regimen. Another oil used widely is avocado. This fruit is used as a dressing for salads and is eaten separately. There is some evidence that cinnamon helps keep blood sugar in check. Arab women use cinnamon in many meat based dishes. This combination is strange to Western tastes but it might have something to do with the generally good health enjoyed by Mediterranean people. This is Arab style Greek yogurt. It has traditionally been made from goat’s milk in a long process that first turns the milk into regular yogurt. Then the yogurt is hung so more moisture drips out. It’s ready in 24 hours and is a staple of many Mediterranean homes. The Fava bean is native to Egypt and is the most popular bean in an area that stretches across the Eastern Mediterranean region from Egypt. The garbanzo bean is more popular further north. In either case, beans and lentils are a major part of this diet. 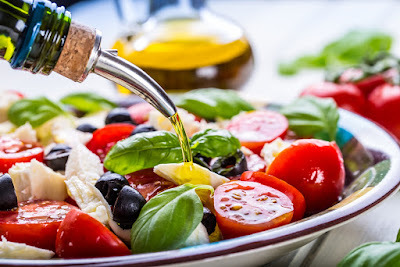 The Mediterranean diet is so tasty that many people who try it find that it’s much easier in this diet to reduce food portions and the sheer quantity of food eaten. That is a big step toward healthier living.